I found Am I conveying disrespect if I omit my gender pronoun from a conference nametag? through the Hot Questions list. I was interested in posting an answer, but I don't see the answer box. I have 101 reputation here, but there isn't supposed to be a reputation minimum for posting answers. I also see answers from people with 41 and 17. Are there extra restrictions because it's a hot question or because there are already lots of answers (13)? 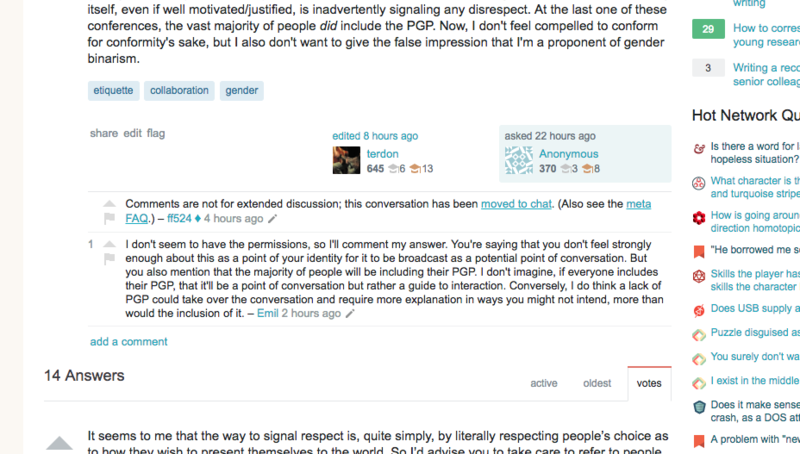 Someone else with reputation = 101 posted this comment, implying that they're having the same problem: "I don't seem to have the permissions, so I'll comment my answer." That question is protected, which means you need to have certain rep to answer it. The association bonus doesn't count for that calculation. Not the answer you're looking for? Browse other questions tagged support bug status-completed answers . What can be done to address provocative behavior by OP?